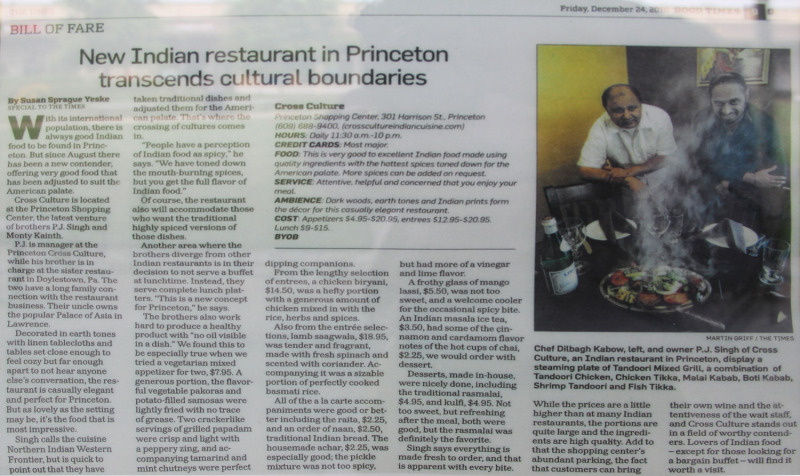 With its international population, there is food to be found in Princeton. But since August there has been a new contender, offering very good food that has been adjusted to suit the American Palate. 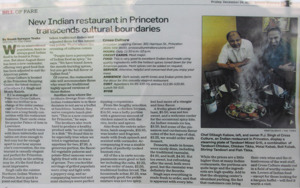 Cross Culture is located at the Princeton Shopping Center, the latest venture of brothers P.J. Singh and Monty Kainth. P. J. is manager at the Princeton Shopping Center, while his brother is in charge at the sister restaurant in Doylestown, PA. The two have a long family connection with the restaurant business. Their uncle owns the popular Palace of Asia in Lawrence. Decorated in earth tones with linen tablecloths and tables set close enough apart to not hear anyone else’s conversation, the restaurant is casually elegant and perfect for Princeton. But as lovely as the setting may be, it’s the food that is most impressive. Of course, the restaurant also will accommodate those who want the traditional highly spiced versions of those dishes. Another area where the brothers diverge from other Indian restaurants is in their decision to not serve a buffet at lunchtime. Instead, they see complete lunch platters. “This is a new concept for Princeton,” he says. The brothers also work hard to produce a healthy product with “no oil visible in a dish.” We found this to be especially true when we tried a vegetarian mixed appetizer for two, $7.95. A generous portion, the flavorful vegetable pakoras and potato-filled samosas were lightly fried with no trace of grease. Two crakerlike servings of grilled papadam were crisp and light with a peppery zing and accompanying tamarind and mint chutneys were perfect dipping companions. From the lengthy selection of entrees, a chicken biryani, $14.50, was a hefty portion with a generous amount of chicken mixed in with the rice, herbs and spices. Also from the entrée selections, lamb saagwala, $18.95, was tender and fragrant, made with fresh spinach and scented with coriander. Accompanying it was a sizable portion of perfectly cooked basmati rice. All of the a la carte accompaniments were good or better including the raita, $2.25, and an order of naan, $2.50, traditional Indian bread. The housemade achar, $2.25, was especially good; the pickle mixture was not too spicy but had more a vinegar and lime flavor. A frothy glass of mango lassi, $5.50, was nor too sweet, and a welcome cooler for the occasional spicy bite. An Indian masala ice tea, &3.50, had some of the cinnamon and cardamom flavor notes of the hot cups of chai, $2.25, we would order with dessert. Desserts, made in-house, were nicely done, including the traditional rasmalai, $4.95, and kulfi, $4.95. Not too sweet, but refreshing after the meal, both were good, but the rasmalai was definitely the favorite. Singh says everything is made fresh to order, and that is apparent with every bite. While the prices are a little higher than at many Indian restaurants, the portions are quite large and the ingredients are high quality. Add to that the shopping center’s abundant parking, the fact that customers can bring their own wine and the attentiveness of the wait staff, and Cross Culture stands out in field of worthy contenders. Lovers of Indian food-except for those looking for a bargain buffet – will find it worth a visit.